Set the scene: A warm summer’s day, August 10th of this year, London, Natural History Museum. I’m sitting on a bench in one of the many named corridors, with hundreds of people going by in front of me in both directions. Some sit down next to me for a brief break before resuming the walk past the exhibits, among them dinosaur fossils, and explorations of evolution and Darwin’s theories, just to name two. From my vantage point I absorb the atmosphere, watch the faces of those on the go and all along the day’s events are stuck in my mind with the rewind button in constant use and the scenes being played over and over again. As the scenes unfold anew, names are drifting from the mouths of the ‘players’ and more than once I find myself clasping the book on my lap bearing one of the names. Prior to this day my encounter with the name had been from the literature, more specifically some papers published in the former Fauna of Saudi Arabia, now aptly named Fauna of Arabia. 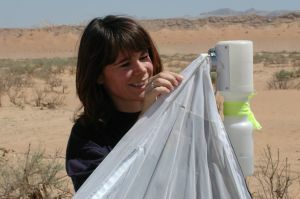 The papers had been manuscripts desc-ribing and recording bees and wasps from the Arabian Peninsula. The man who had written these papers was called Kenneth Guichard and during the course of the morning I had learnt a lot about him from the staff at the Entomology department, and specifically people in the Hymenoptera section (bees, wasps, saw-flies, ants and other related groups). I gathered that this entomologist had inspired many other people to become enthused about ‘bugs’, such as Ian Hamer, a name I had frequently seen in our archival material on the ENHG website. Ian Hamer wrote copious notes for the Bulletin that preceded the official ENHG journal Tribulus. Hamer collected much material in the UAE. He retired some years ago and subsequently wanted to find a home for his collection. George Else, a hymenopterist at the museum specialized in bees, was delighted to visit him at his home in North London and collect the many specimens in 2001, now incorporated into the Natural History Museum collection. This broadsheet is published free to families in the Al Ain area. If you are a member planning an activity with a natural history theme please notify us so that others can join you. Everybody is able to contribute to ENHG and Emirates recordings. For more on our activities please visit our website <www.enhg.org> or join our e-mail discussion group at ENHG@Yahoogroups.com. The Group meets at 7.30pm on the 2nd & 4th Tuesday of the month, usually at the Intercontinental Hotel. New Members are welcome. So why was I at the museum in the first instance? My purpose at the museum was to seek help with identification of materials we had collected over the year using a mercury vapour light that had been kindly lent to ENHG by ERWDA (Environmental Research and Wildlife Development Agency). Although ERWDA use their equipment continuously, Chris Drew allowed us to take away the generator and light set-up whenever we asked for it. The result is that we have now built up a substantial collection of insects, together with a much better understanding of seasonality, behaviour, and diversity of insects in this region. Insects are numerous and to know something about every insect order is almost impossible so the help given by the museum has been essential to the tedious and slow process of putting names to specimens found. In return, we donate specimens to the museum collection and over the past three years we have deposited about 100 specimens, all of them including ENHG on the data label. ENHG has been able to afford a set-up of our own so this work continues and although we return on a monthly basis to Wadi Tarabat, we have also visited many other sites and are going to be able to draw comparisons between the different habitats. The ultimate aim is to be able to record insects without having to collect much more material but to use our reference collection that will include specimens verified by museum staff. Our collection recently ‘doubled’ as a result of Mike Gillett’s donation of his collection to ENHG. The ENHG collection is the largest of its kind in the UAE and it is hoped that eventually it will be placed in a more suitable home. Earlier this year we hosted the Inter-Emirates Weekend and one of the evening events included light trapping. 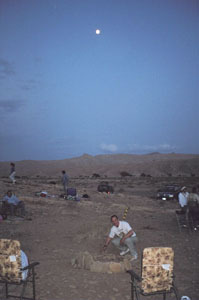 That evening we collected an insect not previously recorded in the UAE. The insect is commonly known at a mantisfly, though this name is somewhat misleading. The insect belongs to the Order Neuroptera (Family Mantispidae) and so is closely related to ant-lions and lacewings. Using the museum collection I was able to tentatively identify the specimen as being Mantispa nana, of which there were some at the museum, collected in Oman by Larsen. Larsen has published extensively on the butterflies of Arabia and so it was no great surprise to find butterfly scales on the matisfly on closer inspection! Mantispidae have interesting habits! The young are predators in the egg sacs of spiders, draining egg contents through a sucking tube. Just before leaving the UAE, Mike’s son Conrad Gillett visited him. Conrad prepared an artistic painting of the insect (see picture). 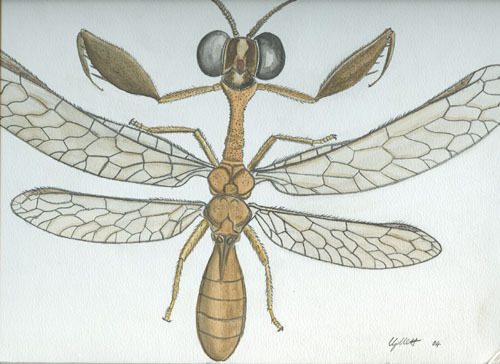 Conrad Gillett’s illustration of the Mantispidae found in the U. A. E.
This annual event is one of the best community activities the ENHG undertakes. About 5:00 pm on Friday evening people began gathering in the empty lot in front of the Buraimi Hotel. We headed out in our various vehicles, 4x4’s and sedan cars, towards Fossil Valley and the Hanging Gardens on the Mahda road. Shortly after passing the turn off to the Hanging Gardens a dirt track led off to the right and we followed it to a lovely location behind a couple of low hills. Small groups climbed the low hill, watched the sun set and the moon rise. 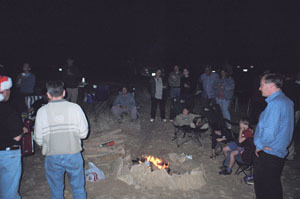 Here, in the lee of the wind and out of sight of the highway, 45 – 50 people gathered round a lovely campfire ringed with stones, precaution-ary windbreak built in and fed with wood scraps brought from home. A bed of coals quickly formed and cooking began. Chicken legs, lamb chops, fish, vegetables, apples and more were put to the coals. Tables were set up and lamps lit. Coffee, tea, sodas, juices… all you could ask for to drink. After repast a bit of Christmas music floated on the air and a choir formed to sing. Voices, music, children laughing, people gathered just listening – it was magical. We carried on into the evening sharing, talking, eating and making merry in the finest sense of the term.Wrap up came all too soon, and by 10:00 all were gone, wending their way out over the flat desert back to the highway home. A very Merry Christmas to all – and to all a good night! November 26th dawned as a clear, crisp morning with temperatures in the low twenties; an ideal time for a trip to a wadi or the desert. But 13 ENHG members did something completely different. We journeyed to the big city of Dubai for a special viewing of Maps at the Majlis III, the third exhibit of historic maps of Arabia presented at the Majlis Gallery. The group set off in five vehicles from Al Foah ADNOC station at about 9:15 am. 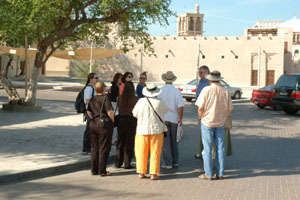 Led by Geoff Cosson, who used to live within 100 metres of the gallery, we arrived in the Dubai Historic Buildings District with the convoy intact at 10:30. With a half an hour before our appointed time, we took the opportunity to take a quick look at the bastakia buildings and the abra and dhow traffic on the Dubai Creek. At the gallery we were joined by some folks from Dubai who had enjoyed the trips at the Music Festival and had followed our email list with envy since. about the changes in technology used in map printing over the centuries from woodcuts through copper engraving to steel engraving and modern lithography. 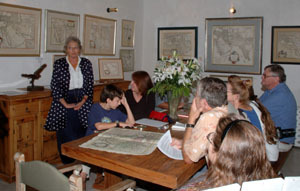 Using an unmounted map from the 18th century, she demonstrated how to examine a map to evaluate if it is an original and if the colouring is old or modern. The examination started with the back of the map, showing how it was folded to go in an atlas with a guard strip of paper on the back to insert it in the binding and still allow the map to be opened flat. We could also more easily tell from the back that no repairs had been made to the map and that the colouring was done in the period the map was printed since the acids in the green pigment had stained the back. Fay Huidekoper-Cope, the curator of the exhibit, in the Majlis. Following the discussion of cartographic technology, Fay presented some history of the individual maps, their makers and how the history of discoveries could be seen with changing map features. It was a very informative and fascinating presentation. I’d like to again extend our thanks to Alison Collins of the Majlis Gallery and Fay Huidekoper-Cope for opening the Gallery especially for the Al Ain Chapter of the ENHG on a Friday morning. We really enjoyed the opportunity. Many of our local museums and hotel shops include collections of jewelry, especially the heavy silver necklaces which often have coins attached. We saw some on our recent ‘after hours’ Al Ain museum visit. These coins are almost always the big ‘Maria Theresa’ silver dollars, which have an intriguing history of their own. < http://www.jdsworld.net/article/m_theresa_thalers.html > “JD” White has lovely images there, and more. The coin is called a ‘thaler’, taking its name from the silver mines of St. Joachimsthal in Bohemia, part of the Austrian Hapsburg empire in the late 18th. century, when Maria Theresa was Empress. In order to improve her empire’s finances, she insisted on a stable currency based on good quality, well-designed coinage, with a guaranteed weight of silver. This was essential at a time when a currency’s value depended on its precious metal content, and when monarchs regularly debased theirs by reducing the proportion of gold or silver. The coin is quite large, 4 cm. in diameter, & contains 0.75 ounces (23.4 grams) of pure silver, so feels substantial and solid. This probably helped its popularity with traders. The design on the front is of MT herself, looking rather stately & plump, with an abbreviated Latin list of her titles (Roman Empress of Hungary, Queen of Bohemia). 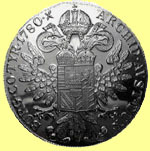 The obverse carries the Austrian/Hapsburg coat of arms, with its double-headed eagle, and more abbreviated titles (Archduchess of Austria, Duchess of Burgundy, Countess of Tyrol), and the date. The thaler was widely used in international trade…the Dutch even called their coins ‘daalers’, whence dollar. By the time of her death in 1780, the coins bearing her profile were used widely, especially in the Turkish–controlled areas of the Middle East & Arabia, where it was regarded as more trustworthy than Turkey’s own money. Arab, Greek, Armenian & Jewish traders wanted MT thalers for their coffee and other exports to Europe, and thence their own trade within the Arab world. Such was the demand, that MT’s heirs allowed the continued minting of thalers, always bearing the same date of 1780. Other countries saw an opportunity, and identical coins were minted in many other places including India. In the Gulf, thalers were used alongside Indian rupees for most commerce before the 1960s. Over the years, they were used not only for legitimate trade, but also for bribery of local rulers. The Italians acquired the original dies from an unwilling but cowed Austria during the 1930s, and minted more thalers to finance their Abyssinian war. Undeterred, Britain’s mint produced another 14 million during the 1939-1945 War, for undisclosed purposes! The Austrian Mint is still making them, even though countries now have their own currency, and despite major discoveries of silver which have kept the bullion price low. Records indicate that at least 400 million have been produced since 1780….which means you can still get one for Dhs. 30 or so in the souks. Which brings us back to the museum. As both currency and a precious metal, the thaler was a popular way of holding wealth, either as coin, or as a source of high-quality silver for ornamentation. It thus finds its way into jewelry, and as a portable dowry which a woman could keep close control of. 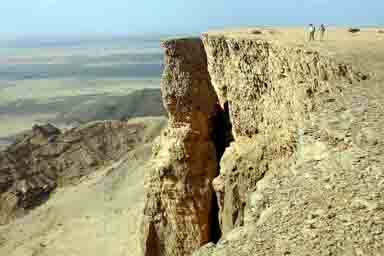 On December 2, a small but enthusiastic group of hikers met outside the Buraimi Hotel at 7am. We waited until 7:15 as I had two more names on my list of “definites”. However, they didn’t show up. As usual we took the minimum number of vehicles and were walking up the approach wadi half an hour later. Our first stop was to look at some pools of reasonably ”fresh” water. Water was still trickling into one pool from the base of the rock. Close by were the remains of a donkey, scavengers had done a good job and very little remained. Just for a change we decided to follow the tourist route but made a slight detour near the base of the plateau. Amongst the boulders we came across the remains of a shelter. In it were pottery shards, mostly of the ubiquitous cooking pot, there was a small piece of glazed pottery possibly from a coffee cup and one piece that from the coarseness and thickness of clay could possibly have been pre-Islamic. We continued up and around the back of the plateau at a leisurely pace. As we walked into the wadi leading onto the plateau we spotted an Omani lizard (Lacerta jayakari) basking in the sun. It was about 30 centi-metres long and stayed around just long enough to have its photo taken. Further in there were pools of “fresh” looking water. Interestingly there were no signs of mosquito larvae only very active water beetles. An Omani lizard ( Lacerta jayakari ) basking in the sun. After a short stop for refreshments at the look-out point I showed the group the fox den on the ledge below. Scrambling back up we shouldered our packs and moved onto the plateau where we descended into a couple of the larger wadis. These afforded fantastic views from where they ended at the plateau’s edge. From one of them we looked down on the Hanging Gardens. two of the group had done this before I felt confident the others could make it as I had watched them scrambling up some serious rock earlier in the day. I called a break for refreshments at the top of the “chimney” before leading them down. At the bottom, the first timers said they had been apprehensive but now felt very pleased that they had conquered their fear. Thanks Mike for your invaluable assistance. Dusk was rapidly approaching so we made haste and got back to the vehicles with about half an hour of daylight left. glimpse of an unidentified raptor. In contrast the flora was lush and abundant many species in flower with some of the shrubs setting seed. It had been a long day but everyone agreed a thoroughly enjoyable one. Thanks Mike, Geoff, Karen and Wolfgang for your company. Those of you who may visit the East coast beaches at night will likely witness the extraordinary phosphores-cence that lays strips of light on the beach and follows every footstep on wet sand. OK there are some of you already know what it is but for those who don’t, read on. "Another phenomenon, more often associated with the tropics, is fairly common around the Greek Islands; this is the "phosphorescent sea". It is seen at its best on moonless nights in late August and September and seems, for some reason or other, to be brightest when a thunderstorm is impending. Then every splash of the oars, every ripple past bow or stern, every swirl in the long wake, is outlined by darting sparkles of greenish fire. A dive over the boat's side is a thing to be remembered forever. As you part the velvety black of the waters, countless millions of green sparks streak past you like a storm of stars. Minute fiery snow-flakes brush you in wind-blown flurries until your flesh squirms with conviction that they must burn you. And auto-suggestion almost convinces you that they do! The sensation is so incredibly eerie that, after a few minutes of it, you generally scramble back into the boat in a hurry. The cause of all this firework display is a unicellular ani-malcule, Noctiluca miliaris, shaped like a tiny translucent cherry. The stalk of the cherry is represented by a short whip or flagellum with which it propels itself by rhythmically beating the water. And the size of this organism, which is sometimes so numerous it can illuminate many square miles of ocean? Only one millimeter (1/25th inch) in diameter - just big enough to be visible to the naked eye." As part of my plan to share information I find about matters of interest concerning plants I am sure you will enjoy reading the above web site. Spread in an ever-widening fan of light. Scrawled scintillating runes against the night. You may be interested to know that Agarwood, from which oudh is extracted, has been recently listed on CITES Appendix II. The highest tsunami ever reported was 1,719 ft. (524m) in Alaska, USA, on July 9, 1958. Lituya Bay is a “T” shaped fiord. A massive landslip occurred at one end of the “T” and this sent a wave out of the fiord, wiping out all vegetation to this elevation. The wave would easily have swamped the Petronas towers of Malaysia (1,483 ft. – 452 m ). 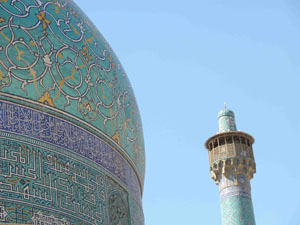 The Lonely Planet describes the ancient city of Esfahan as “Iran’s Masterpiece, the Jewel of Ancient Persia and one of the finest cities in the Islamic world” and for once, they were not exag-gerating. I recently visited Esfahan and there is no better place to feel the peace and tranquility of Islam than in the Imam Mosque that finds itself in the Imam Khomeini Square. For avid photo-graphers or anyone wanting to rest in silence, this Mosque contains a myriad of light, shadows, echoes, and color in the complete silence of the prayer areas, sheltered from wind and all outside noise. The mosque domes, walls, archways, ceilings and passageways are a brilliant array of blues and yellows on highly stylized calligraphy ceramic tiles. The inside ceilings are the same designs found on Persian carpets and all one can think is “how did they do that - it’s so high up?”, a question even more perplexing considering the fact that the Mosque only took 18 years to build. Once the capital of Iran, the Shah (meaning King) Abbas I.
ruled from this palace and welcomed foreign dignitaries. Today, you can walk circling the Square (half a kilometer in length) enjoying the surroundding souqs behind all of the Square facades where Persian silk carpets, chewy gaz (nougat), ceramics, silver works, and pottery are plentiful. This market place dates back, in some places, by almost 1300 years. Watch you don’t get lost in the labyrinth - it is several kilometers long. Local Irani families outnumber tourists in the late afternoon and can be seen eating saffron flavored ice-cream (which you really should try! ), smoking sheesha and drinking mint tea from the cafes, or playing soccer at night in large groups. The grand fountains in the middle of the Square now replace the polo fields (polo was invented right in this square) and to watch the sun set on the minarets of the two mosques and their blue, green, yellow and gold domes glisten in the setting light during the call to prayer is the most peaceful way to crown the day. The air is fresh and clean and a wonderful view of Esfahan in the distance just flanking the mountains can be seen in the near distance. The Shah hand picked this location and it’s not difficult to see why he loved sitting on his royal chair to watch the local action below and the distant city ahead. (Also to be noticed is the pink and peach colored ceiling domes just above and behind where he sat). 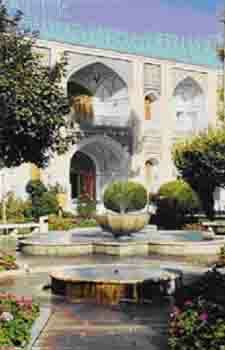 Beautiful architecture and gardens make Esfahan world famous. 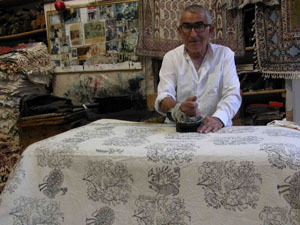 restoration efforts which are evident all over Esfahan. You can buy chai tea and walk for kilometers along the riverside, day or night (and yes, holding hands is allowed provided it is your legal partner) !It is all a very romantic scene and Persian culture, poetry and romance are all alive and well, even in an Islamic republic like Iran. One should not be put off by the propaganda about Iran. It is worth a visit and you’d be hard pressed to find more friendly people who frequently stop you just to say hello and ask where you are from and if you need assistance of any kind. Iranis are keenly aware and immensely proud of their culture; Persian roots of literature, architecture, and art. A history lesson is never far away if you show any slight glimpse of interest. The Iranis I met were very curious about what others think of them, knowing very well what kind of press they attract and their openness on this subject and many others (their direct questioning takes a bit of getting used to!) allows you to walk away with a clearer picture of what Iran and the Revolution are/were all about. Women should not at all be worried about traveling in Iran. The same rules apply as they do in the Gulf, a lone woman will always be served first and attended to with the utmost respect and efficiency. As long as your hair is covered and you have the appropriate clothing, and the no-touch rule is respected between genders, you can expect your stay to be like anywhere else. Tehran on the other hand is not a place to linger in longer than you must. It is heavily polluted and crowded, yet has an urban comedic allure to it. Traffic jams are frequent. On the way to the airport, we were completely stopped in traffic for over twenty minutes. Men sat on their hoods smoking cigarettes, women tying and retying their head scarves, talking to one another and to the adjacent cars from their open windows. Yet, it all seems to work somehow and the sense of community and social respect is not lost in the metropolis. Cigarettes and shared back and forth and mirrors borrowed, lipstick reapplied, conversations and laughter flow. from forming new traffic lanes - which they do anyway once they’ve passed the police patrols. Nine lanes on a five lane freeway is typical and seems the only way to get anywhere. The infrastructure is hopelessly stretched for the booming 14 million Tehranis. The martyr murals on the walls of drab and gray buildings speak to the harshness of the Iraq-Iran war. Families commission artists to paint their men who have died for Iran. They are considered national heroes, and take their place alongside the only other allowed murals, giant reproductions of the late Ayatollah Khomeini, the present Ayatollah Khameini, and the President of the Republic, Mr. Khatami. The wounds of the Iraqi war are not far behind and speak to a turbulent not-so distant past that seems to linger in the gray and congested air of the city. There are many intellectuals here. Some trying to understand, making sense of Iran’s place in the world, and making do with the present order and government, while others trying to push against the established order - quietly and not so quietly - others reminiscing about the pre-Revolutionary days and others, younger, curious about the world yet perplexed about the world’s reaction to them, the Revolution being all they have ever known. 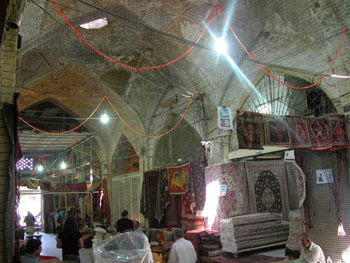 Tapestries such as this one are important Iranian products. Mike has been in the UAE for 13 years, working as a biochemist at the FMHS, UAE University. He has contributed greatly to the knowledge of insects in the UAE. His own favourite group are the beetles (Coleoptera) although he has also written about moths and butterflies (Lepidoptera) and many other arthropods. Over the years Mike has written many articles, describing new records to the UAE. Recently Mike has intensively studied the largest beetle that occurs in the UAE, a type of longhorn beetle. I joined him and his son Conrad (also a coleopterist) on an early morning beetle watch, and we found three of the desired beetle, all males. I was on my way to Dubai so took these with me to show my students. Hence, about 40 students benefitted from Mike's new collecting technique and the opportunity to see these beetles alive. A funny twist to the story came that evening when some folk had gathered at my home, including Mike and his son Conrad and we remembered the beetles. Fetching them and the nearest vessel I could find I handed all this to Mike who let out the beetles to show everyone. As it was now evening time these nocturnal insects had become very active and as soon as two were placed together in the vessel I had provided they began to fight. Mike and Conrad were very pleased to see this behaviour but were also worried about the beetles getting damaged so Mike put one on his arm and went to pick another up when...... lo and behold.. it grabbed his finger, biting him and drawing blood!!!! Mike shrieked and the vessel, a glass bowl, went flying through the air, crash-landing with a clang in a duet between splintering glass and a hurt cry from Mike! How about that for beetles getting their own back! In the spirit of Science Mike's first words after his recovery were: "Well, we've learnt something else about their behaviour now...". And it is that spirit that we'll all miss on our field trips and workshop meetings. As most members will realise, Mike has been collecting and studying insects during the whole time he has been here and this has resulted in a reference collection of specimens. Mike has generously given the Al Ain Chapter of the ENHG this collection for safe keeping and use. The collection and observations made by Mike are invaluable and it is our intention to ensure that the specimens go to a safe permanent home, e.g. a natural history museum, one of these days. Hours of work have gone into preparing and curating the hundreds of specimens, and with it greater knowledge of what occurs in this part of the world. Everyone hears the mention of biodiversity. Biodiversity can only be measured once specimens have been recorded and reported. Mike's collection is important for many reasons, this being one of them. 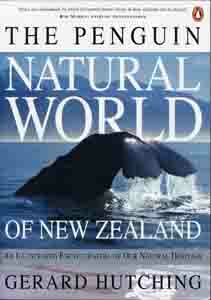 It is only possible to understand an ecosystem once all the species that exist within it are identified. Many insects are primary consumers and together with the primary producers (plants) form the basis of all other food chains and food webs. An understanding of what sustains these food webs makes it possible to understand, assess and advise on whether developments will have an adverse impact on animals that are under threat of extinction. Indeed, many insects are on danger lists due to habitat fragmentation and contributions such as Mike's are needed to understand distribution of such species. The Committee is indebted to Mike for the gift of the collection and together with all the members and everyone who is likely to benefit from the collection we would like to express a great big 'thank you'. We wish you well in your next adventure and look forward to many visits. We have a substantial library of books, including both specialist and ‘general interest’ titles. The library is housed in the ENHG workroom, at Al Ain English Speaking School. The full list of titles is on our website. Whilst some atlases & maps are for reference only, most of our books can be borrowed by members. All you have to do is come along on a committee night & browse, or contact me at the school (767 8631). Books can be borrowed for one month, and can be returned on meetings nights, or through one of the committee. At our Annual General Meeting this year, Mark Beech, from ADIAS, gave a presentation on the work being done on the ancient house & skeleton find on Marawah, one of the offshore islands of the UAE. This find looks like the oldest example of ancient civilization in the UAE. and possibly in the Middle East (7,600 yrs. old). For more on this, see <http://www.adias-uae.com/>. Rudi Schnitzler (PhD student at Victoria University in Wellington, New Zealand), has been researching "habitat fragmentation effects on parasitoid diversity and tri-trophic interactions." His presentation was most interesting and well supported with slides. He presented the ENHG with an illustrated encyclopedia of the natural history of New Zealand - a great addition to our library ( see inset). The lovely thing about this presentation was that Rudy was on his way back to New Zealand from Germany. He had spotted our website some time ago and contacted us to see if there was any interest in his topic. This is why the website is so important. Thank you Rudy for both the fine presentation and for expanding our world. On December 14th, Dave Clark gave us an insightful presentation on the water resources of the UAE and Bangladesh where he has recently beemn working. members wishing to learn more will just have to wait for his next presentation. Just a reminder that the Annual Photo Competition is not that far off. Check the website for details! 12-12 - The UAE's National Clean-up Day was a great success here in Al Ain. Members showed up and helped pick up lots of garbage in an area adjacent to last year's site. Local school children participated as did local businesses. The ENHG also did a follow-up weekend clean-up trip for those who wanted to participate, but who were unable to get away from work during the cweek. So a group went out to a local oasis/wadi and picked up trash for 2-1/2 hours. This is our way of showing our thankfullness for the openness of all the inhabitants of the oases who welcome us whenever we tour their areas. Let's make a bigger effort next year. 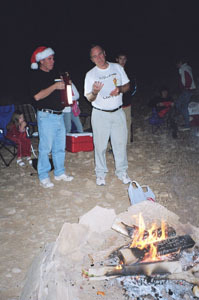 And finally, but not leastly - on December 30th a group sallied forth to a location just outside of Ray/Fay on the Hatta road. 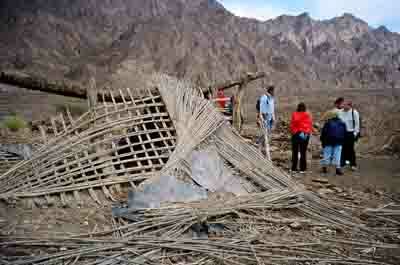 The village offered the khaima type rock house with the roof still in place (though sagging somewhat). We were able to appreciatehow these structures servered their inhabitants, providing shade, ventilation, security, privacy and all the necessities of domesticity. Phil Iddison, a life member, was in Al Ain for just a couple of days and provided us with an excuse for one last outing. Buildings were measured, GPS locations were taken. The information will be written up and a copy provided for the ENHG. The khaima style roof used widely throughout the UAE up until quite recently. This site was abandoned no more than 25 years ago.and possibly less. Happy New Year one and all!